The couple had always discussed that if they got married, it shouldn’t be a big or lavish wedding. It just didn’t fit them. They wanted a memorable experience, with their closest loved ones and friends, and also something that was easy. That’s how they landed with Andrea at Destify. 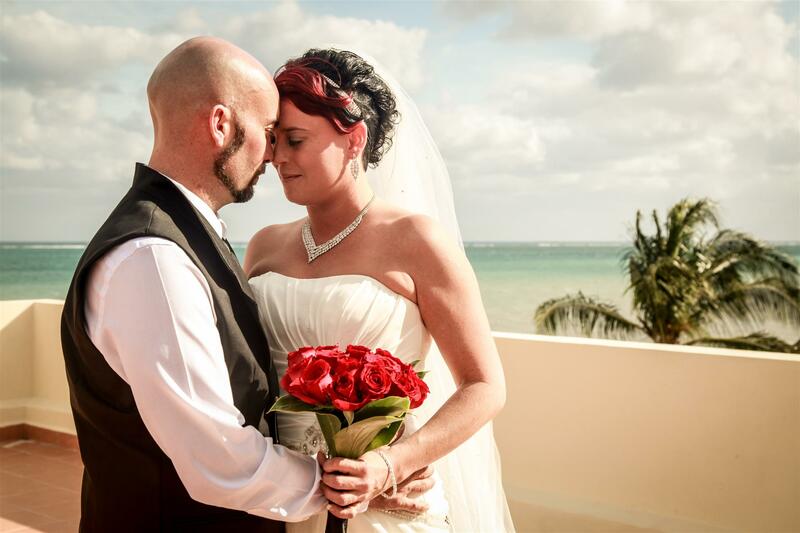 Together they went through many resort options and locations before choosing Ocean Coral and Turquesa Resort in Cancun, Mexico. It felt like the perfect fit and the pictures were gorgeous. Once in contact with the wedding department, planning was a simple and easy process. Once the couple got to the resort they met with their coordinator for a brief 20-minute meeting to finalize plans. The couples’ package had just about everything they wanted, but they added some extra bouquets and flowers. On the day of the wedding, Rhonda had the coordinator meet with her as she got ready, and they revamped some last minute plans so that none of the guests (or Ryan) saw her before she walked down the aisle. They held their ceremony at the resort’s beautiful gazebo at sunset. Afterward, they had a photo shoot with their photographer. Their package allowed for the newlyweds to host both a cocktail hour and a dinner reception at the resort. Everyone took full advantage of the delicious food and unlimited drinks. Their 23 guests stayed anywhere from 3 to 10 days enjoying their very own vacations while the couple enjoyed their honeymoon. The couple loved how carefree the entire process was. Rhonda’s advice is to trust the wedding department and your agent. Andrea was there with quick response time and helped with a small language barrier at some moments. The process was professional and there were no worries, just an amazing time had by all. We just had to show up and live in paradise for 10 days.